I got ahead of myself with the last post, and actually this one has been sitting on my computer, half-finished, for some time. 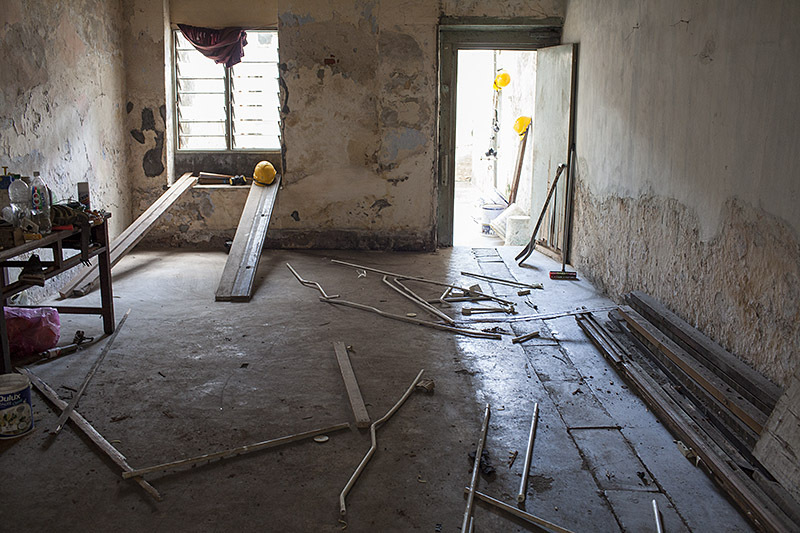 Before we could begin demolition and clean-out at Ah Tong Tailor, there were procedures to be followed and permission to be gained. As much as we love George Town (an ardor that grows every time we drive into town to check on progress at the house, which inevitably carries us down a side street which, on that day, is home to some curious happening or another, like this), we would never have purchased property in the city if it were not a UNESCO world heritage site. Why? Because the world heritage designation guarantees — or gives as close a guarantee as is possible here in Malaysia — that neighboring structures will not be pulled down and replaced with a 25-story condo building. You laugh, but I am serious. In Hong Kong, in Shanghai, in Bangkok, in Saigon — in every Asian city in which we’ve lived, except for Kuala Lumpur — we have, for all or a portion of our residency, lived next to or within earshot of a construction site. In some cases we lived beneath a unit being renovated while living next to or within earshot of a construction site. In this part of the world (Singapore may be an exception here) there is no public consultation vis a vis demolition/building, nor are there any rules once construction begins. If you’re unlucky enough to find yourself living next to a construction site, which can happen with no warning whatsoever — as in Saigon, when I woke one morning in our lovely just-renovated French colonial villa overlooking the park in the center of District 1 to find the equally lovely French colonial bungalow next door being bulldozed (by the City of Hanoi, but that’s another story) — you may fall asleep (or try to) and wake to the glare of floodlights and the sound of jackhammers. Dave and I often joke that our years in Asia have left us with construction-related PTSD. Though that’s probably not a joke at all, because it is still the case that whenever I hear jackhammers my stomach folds in on itself. But we are protected from that in George Town, we think. Technically speaking, buildings within the world heritage site cannot be torn down and replaced unless they are structurally dangerous and beyond salvage. (That said I have seen at least two structures in Little India fall to the wrecking ball since we bought Ah Tong Tailor. There are always property owners willing to — and well-connected enough — to flout laws and regulations.) We may yet suffer through top-to-bottom renovations in the two shop houses with which we share party (common) walls. But renovation noise is a far sight less painful than the rhythm of a pile driver. There are other building/renovation regulations in George Town (or any UNESCO world heritage site) — facades must not be altered, extra stories must not be added, etc. And one of the means of enforcing those regulations is by requiring all property owners to obtain permits before beginning work. Many property owners don’t bother with this formality; they just slap up metal hoardings around the structure and go at it. To some extent I sympathize — the bureaucracy surrounding permit acquisition is thick as mud, and if you are a business owner bleeding money waiting for the wheels of bureaucracy to turn is especially painful. 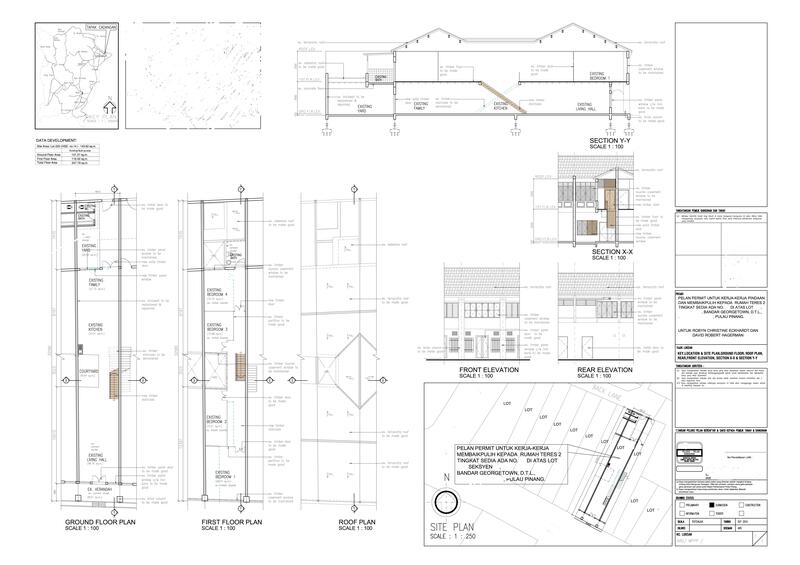 But our plans for Ah Tong Tailor were not complicated, nor were they against the spirit of the heritage guidelines. We did not plan to sneak an additional story in under the cover of darkness, nor did we want to make other alterations to the structure or its facade that would radically alter its character. And so we suspected that securing a permit would present no difficulties and could be accomplished in a timely fashion. “Do it legally,” a local conservationist admonished me in her best imitation of a school marm when I happily told her, during a chance meeting at a favorite coffee shop in George Town’s Little India, that our purchase had finally gone through. So much for “Congratulations”. She needn’t have snarked; we’d planned to do it by the book all along. 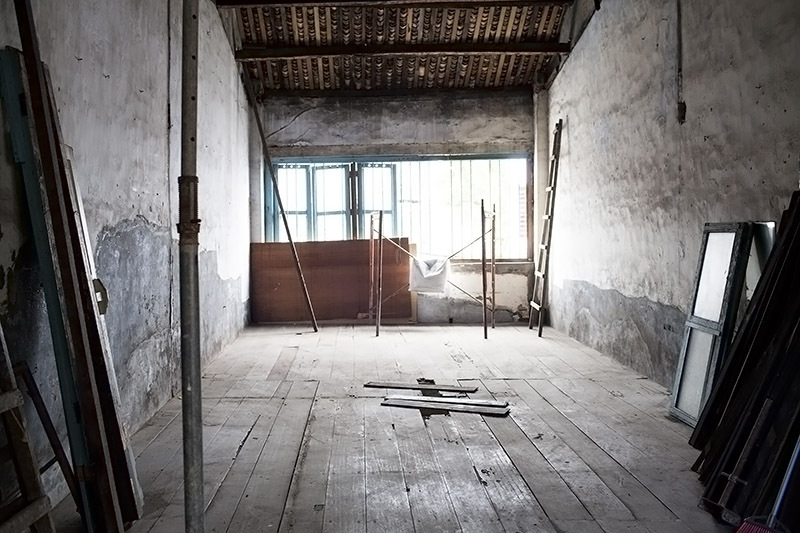 Our planned changes were so minimal: removing/moving the timber room partitions, updating/rebuilding the ground floor outhouse, updating the upstairs “bath”, reversing the direction of the staircase and building a kitchen where there wasn’t much more than a sink and a portable gas burner. 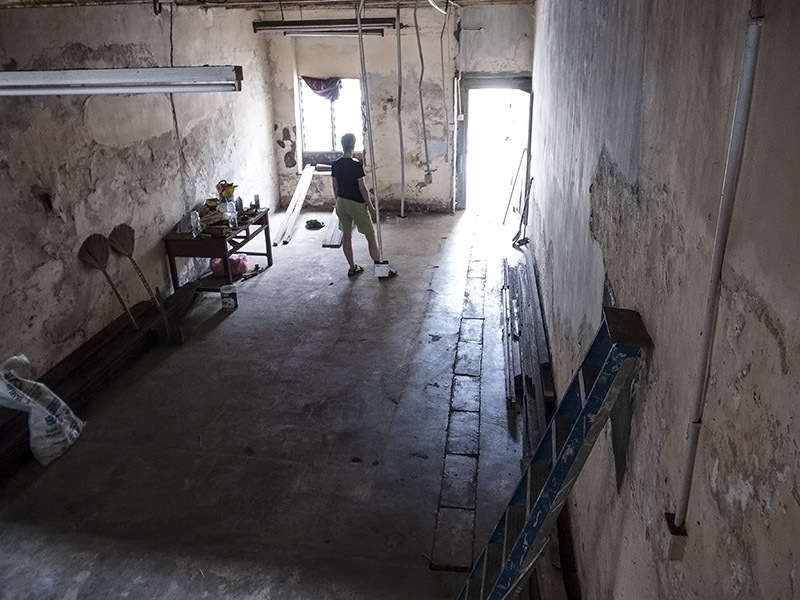 We would be refurbishing rather than restoring (an important distinction — here is an excellent, fairly detailed blog on a conservation/restoration project in George Town). So we didn’t need the consultation of an (expensive) restoration specialist architect. Instead, on a recommendation from a friend we hired an agent or consultant who could take us through the permit procedures for a reasonable fee. The whole process took about 6 weeks. 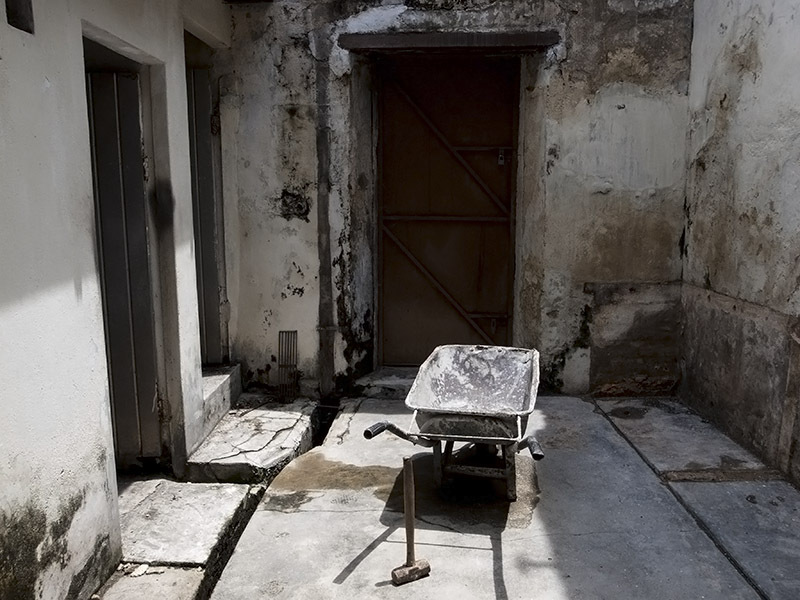 In September of 2010, about a month after we’d taken possession of Ah Tong Tailor, we met Agent O — who, as a sometimes-contractor, knows all about buildings and refurbishment of “heritage” structures — at our house and did a walk-through. He relayed our vision to an architect with whom he had worked in the past, who then put it all down on paper. We were living in Kuala Lumpur at the time so the architect emailed the plans. We asked for a few minor adjustments (such as move a partition here, make the rise on the stairs lower and the tread deeper), the architect made the changes and, all told, we had final plans within a couple weeks. (The plans are up top.) We filled out some forms, made photocopies of passports and deed and other documents and wrote a check and Agent O filed a permit application with MPPP (Municipal Council of Penang Island). Three or four weeks later our application was approved and the permit issued. We were now good to go. Easy enough. Now it was time to get down to the monetary nitty-gritty. We needed to find a contractor and find out exactly how much our vision would cost us. Agent O introduced us to C, a stocky guy with a big stride and a firm handshake. 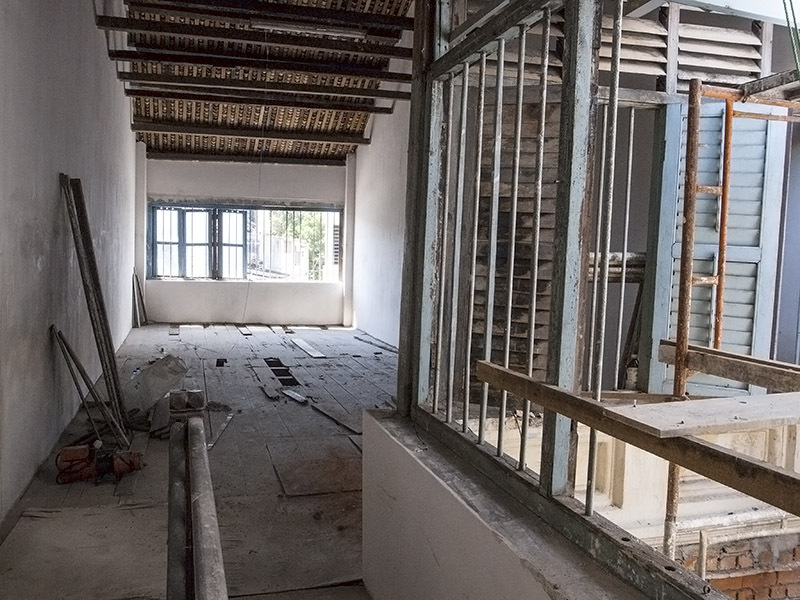 Experienced in all kinds of renovations, he told us with a big plastic smile, referencing a few projects around George Town that weren’t quite to our taste. One of our biggest concerns relating to finding a contractor was identifying That Certain Someone who could appreciate old stuff. Old timber, old beams, old paint, scuffs and scratches, the marks of time, the bits and pieces of a building that would tell its history, or at least say “I have been here for a long time.” Much in our refurbished shop house would of course be new. But we didn’t want it all new. We didn’t want matching floor and ceiling boards and shiny varnished shutters and inexpensive, easy-care synthetic roof tiles. 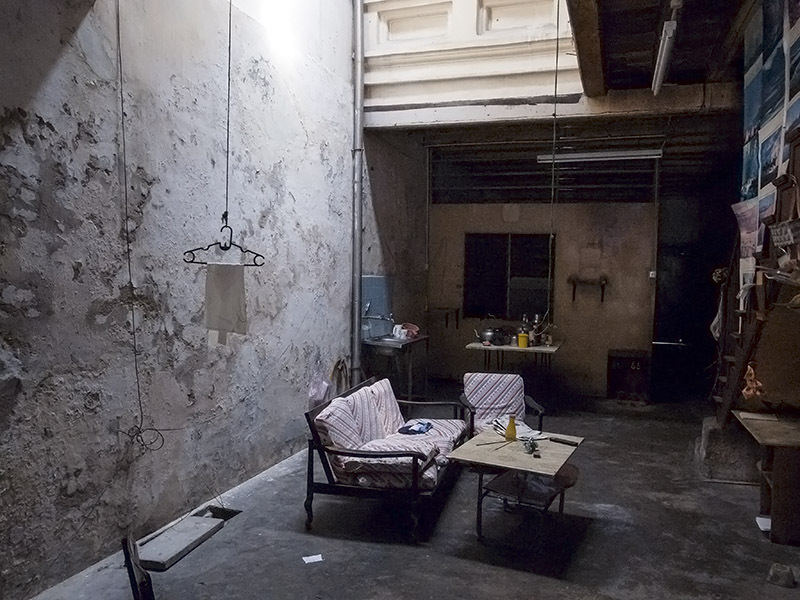 We didn’t want to trap Ah Tong Tailor in a time warp — it had to be liveable — but at the same time we didn’t want it to be a theme park-y ode to Old Skool George Town. We needed someone who “got” all that. 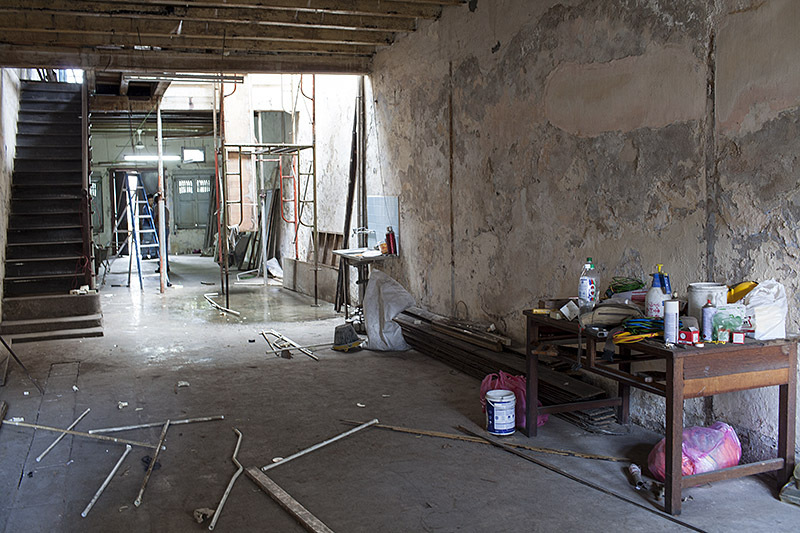 A quick tour of George Town will show that not many contractors do “get” that kind of refurbishment work. Renewed structures like this and this are more our style than this. And we surely did not want this. So we had some doubts about Contractor C going in. But we figured that if his quote was reasonable we could make an effort to be on the scene often enough to reign in his love of varnish. (We are a freelance travel writer and photographer. In retrospect, how realistic was that line of thought?) We met Contractor C at Ah Tong Tailor on a sweltering morning and did a long, long walk-through, front to back, up and down the stairs. We examined boils on the plaster, rot on the beams. We measured stair height and length, stuck our fingers through crumbly wood partitions, took measure of the out house (it would all have to go), examined cracks in cement. Contractor C took lots of notes and so did we. We handed over a copy of the plans and he promised a quote within a week. In two weeks, after a bit of phone tag, he sent one by email. It was as detailed as we could have wished, and three pages long. The cost of which came, in total, to around what we had been quoted in 2000 for a high-end (but small) kitchen renovation in our 1930’s San Francisco Bay Area Mediterranean bungalow. But this would cover the structural and cosmetic refurbishment of an entire structure with about 3,200 square feet of living space (including courtyard). It did not include the cost of replacing beams (because it wouldn’t be known exactly how many beams needed replacing until we got into the structural work), paint, appliances (fans, aircons, kitchen stuff, water heaters, etc.) or bathroom/kitchen fit-outs (sinks, toilets etc.). Still, all in all this seemed like a doable project, certainly one we could never afford to undertake anywhere in our home country. After receiving the quote we drove up to Penang for another meeting with Contractor C. There were a few things we wanted to clarify, and we thought we’d ask for some changes that would likely increase the amount of his quote. We met at Ah Tong Tailor, Contractor C took more notes, we shook hands and he promised to get back to us within a week. It was early November 2010, and we hoped to be in the house by autumn 2011. After all, we had seen refurbishments in George Town that had been completed to satisfaction within 6-8 months. It was the best thing that could have ever happened to us, or to Ah Tong Tailor. It has been, incredibly for me, over eleven months since I was last here. I’m not quite sure what happened. We got busy with work and travel for work, and the house was moving slowly so for a while there it seemed like there really wasn’t much to write about. But probably the biggest reason for my absence is that over the course of this refurbishment there has been next to no drama. 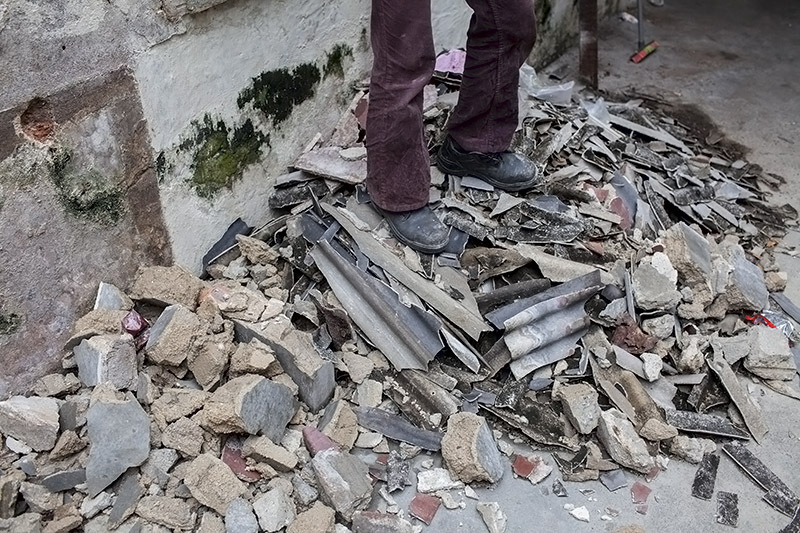 Work is still ongoing at Ah Tong Tailor and we hope to be living in the house by early December. But other than the fact that we’re running a bit behind schedule (we hoped for completion within 8-10 months, our contractor predicted a year, and we’re just about at the one year point) things have gone remarkably smoothly. This is not always the case with refurbishments/rehabs in George Town (or anywhere, I would imagine). Contractors are notorious for a number of unpleasant reasons and we’ve heard some real horror stories from other folks attempting the same here. But for some unknown reason the heavens smiled upon us with this place. We got really lucky with our contractor, whom we refer to as The Man — as in “He’s The Man!” But I’m getting ahead of myself. I’ll tell you about The Man in due course. At any rate, I’ve kept fairly meticulous notes over the last year and Dave has taken his camera on every house visit. So there’s lots to show and tell. 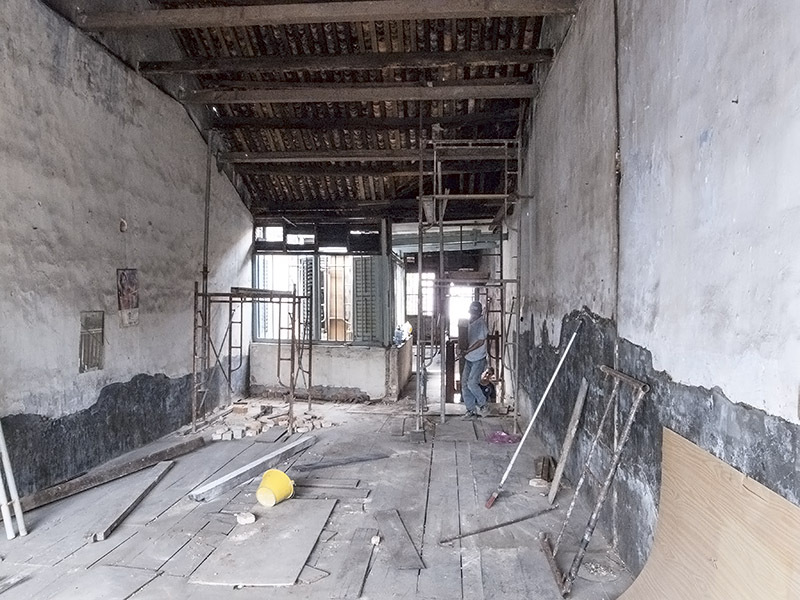 In my last post I shared photos of Ah Tong Tailor as it was when we took possession: essentially a 14 feet by 110 feet double-story rectangle broken up into rooms by wooden partitions. Here’s a couple shots of the ground floor, the first standing just inside the entrance and looking towards the back of the house. The back of the staircase is on the right. In the shot above we’re standing almost at the center of the house (front to back), still looking towards the back. We’re at the edge of the airwell which rises right through the second story and opens to the sky via a retractable roof operated with a pully. So first thing we did after taking possession of the house was to clear it out. We kept a few momentos, which I’ll blog about later, but most everything went. And then the partitions came down. Finally we could get a true sense of what we had to work with. We knew that removing the walls would lighten the place up immeasurably and make it feel even larger than it already did. 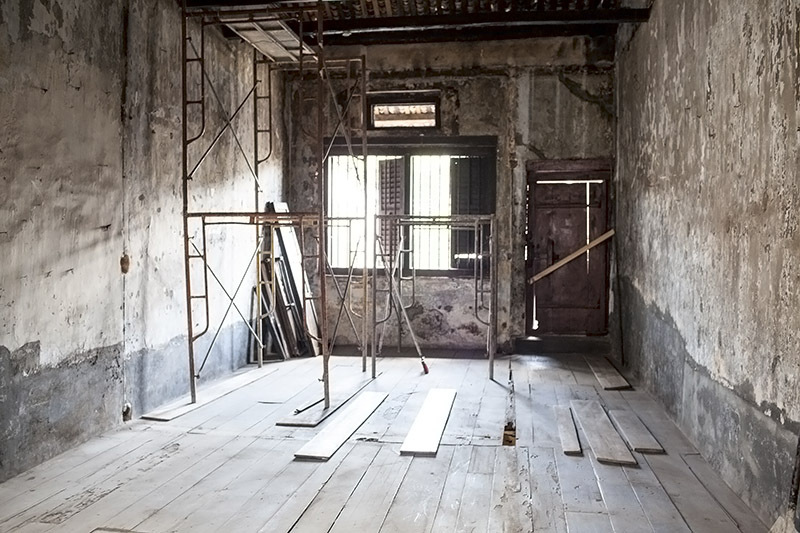 What we didn’t know was how loft-like the house would feel after all those walls were gone. Here are two views of the ground floor. 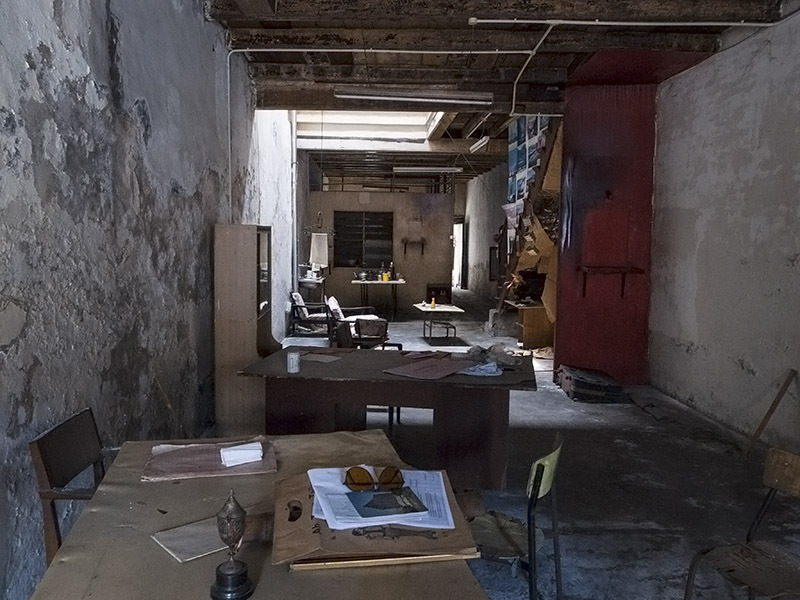 The first photo was taken from the back of the house looking forward — double door entry at the center with the two double windows on either side. Before the partition in the photo above was taken down the front of the house wouldn’t have been visible from this vantage point. And here’s looking out back to the small courtyard. Plans at this point: an entry at the front of the house partially screened from the rest of the ground floor by a traditional-style wooden partition. Most shop houses have these — a wide panel in the center with doorways on either side, and above the doorways a carved wood panel with plenty of punch-outs. The point of the partition is to keep private areas private from passers-by (the five-foot way, or sidewalk, is directly outside our door and anyone passing by can look right through the front windows and straight into the house when the shutters are open) but still allow air flow. After the entryway partition we planned to leave the ground floor open — living room, dining area in the airwell, and a huge kitchen stretching to the back of the house. What’s not visible in the photo above is the old wooden beam above the window, which extended well beyond the right edge of the window to the door frame. You can sort of make out, to the right of the window, a vertical line indicating where the house’s original window ended. It was quite a big window when the house was built. We can’t imagine why it was partially plastered in (in such a warm climate who would want LESS window and air flow?) but we were really excited about the possibility of being able to open up the back of the house further. Another view out back, from the stairs — the cutouts in the concrete floor on the right cover the drain. Standard in these old houses to have the drain semi-open. We planned to close it up to the extent possible, leaving probably one tile to access in the event of an emergency. 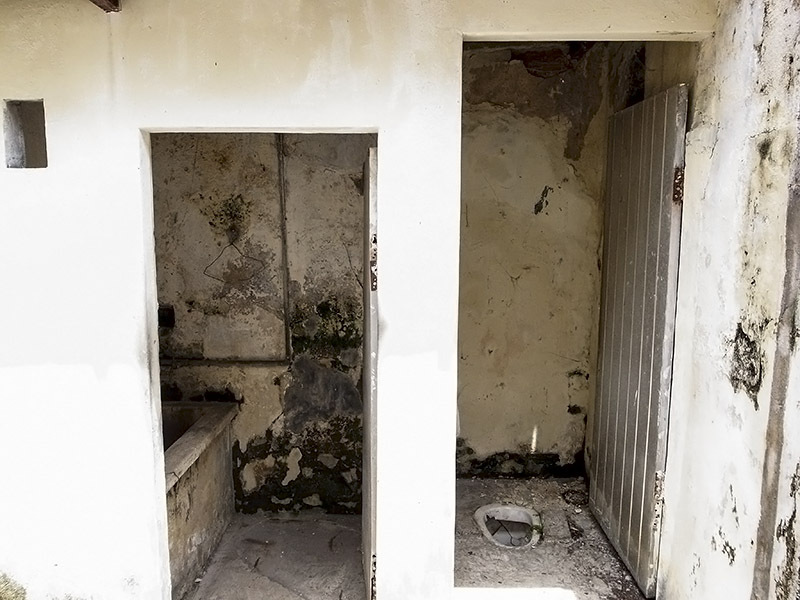 The outhouse had two “rooms” — a shower room and a toilet. We figured we could combine toilet, open shower and sink in one room, in a rebuilt outhouse/outdoor bathroom that would be smaller and thus take up less precious courtyard space. Moving upstairs, the first photo was taken at the top of the staircase and the second further in. Two rooms occupied this space. The airwell is to the right and between the staircase and the airwell is the narrow passthrough to the rooms at the back of the house. At this point we planned for two slightly differently measured out rooms — an office for Dave at the front (the photographer needs light) and an office for me — or a guestroom — behind and looking into the interior airwell. In the photo below, we’re standing at the front of the house looking towards the top of the staircase. The airwell is to the left and stands at the center of the house front to back. Beyond that were two rooms and then, through the doorway on the right, a very rudimentary bath — in other words, a concrete “porch” with a chamber pot, a hose and a spigot. At this point, with all the walls down, we were feeling pretty excited about the possibilities. Both Dave and I love structures with a history, but we also have a fondness for clean, simple — if not minimalist — design. Here in the newly opened-up tailor’s shop it was looking as if we could have the best of both worlds: a period structure that would retain many of its original features with an airy, open loft-like interior that would take well to some clean, contemporary-ish built-ins (the kitchen, especially) and furnishings. All text and images on Ah Tong Tailor are copyrighted. Reproduction and/or use in any media without prior permission of the owners is a violation of copyright.